For too long whenever we discuss Wind Waker, we always refer to Ganon as being the bringer of evil in the game. The one who has escaped the sacred realm and is ready to continue down the long path he walks. What I really liked in the game was the fact Ganondorf revealed the reasons why for his actions we see in Ocarina of Time, which did make him look less like the dreaded evil villain we were led to believe he was, as there is a whole other side to him, but even then, Ganondorf wasn’t the true evil in the HD version of Wind Waker, in the inclusion of a modern day trend, the dreaded selfie. Sure I could be blowing a lot of smoke over nothing, but selfies are evil, and as cute and brilliantly hilarious it is to take a selfie with Ganondorf, during the final battle, it’s still wrong! But now it’s not just selfies is it, for the evil of modern day trends continue to seep into our Zelda games, a fact proven by Tri Force Heroes, for we are welcomed by a kingdom ruled by fashion. One can’t help but dread what may come next, an international acclaimed folk artist in Zelda U? 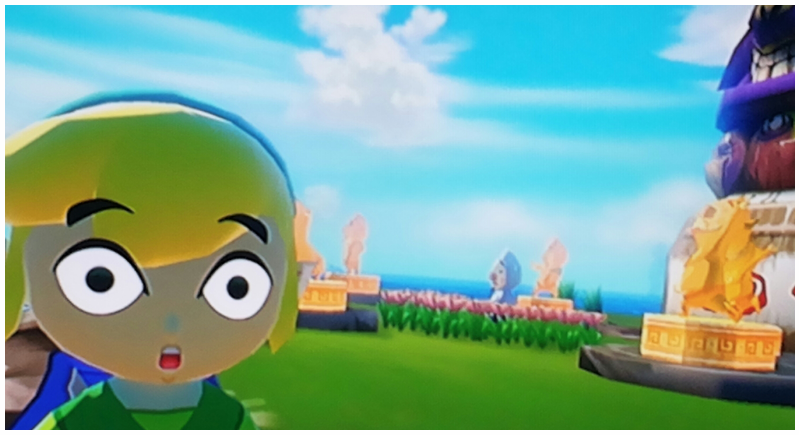 Most likely not, seeing as such a move would be more likely seen in their portable range of games, the fact remains so, the selfie has cemented itself into Zelda history and kicked a door wide open for all other kinds of modern day social trends to come through, barging in and become part of future Zelda games. It’s a crazy old world, then again, it is always interesting to see how Zelda takes these type of things and makes them work.